ESMA forms part of the European System of Financial Supervision (ESFS), a decentralised, multi-layered system of micro- and macro-prudential authorities established by the European institutions in order to ensure consistent and coherent financial supervision in the EU. The main objective of the ESFS is to ensure that the rules applicable to the financial sector are adequately implemented in order to preserve financial stability and to promote confidence in the financial system as a whole, and provide sufficient protection for financial consumers. 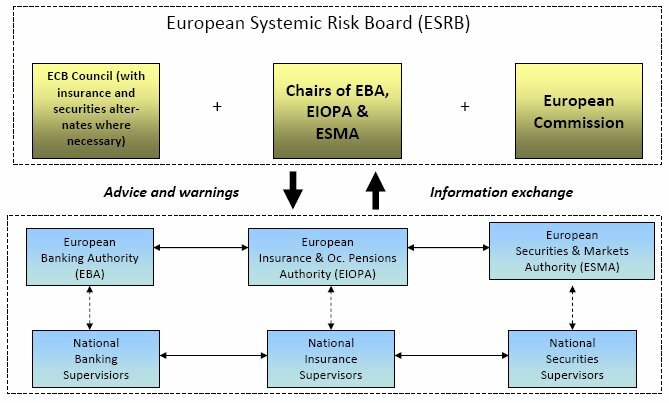 This system consists of the three European Supervisory Authorities (ESAs), (ESMA based in Paris, the European Banking Authority (EBA) based in London and the European Insurance and Occupational Pensions Authority (EIOPA) based in Frankfurt) the European Systemic Risk Board (ESRB), the Joint Committee of the ESAs, and the national competent or supervisory authorities of each Member State. While national supervisory authorities remain in charge of supervising individual financial institutions, the objective of the ESAs is to improve the functioning of the internal market by ensuring appropriate, efficient and harmonised European regulation and supervision. Along with the two other European Supervisory Authorities, EBA and EIOPA, ESMA forms part of the Joint Committee which works to ensure cross-sectoral consistency and joint positions in the area of supervision of financial conglomerates and on other cross-sectoral issues. The European Systemic Risk Board (ESRB) carries out macro-prudential oversight of financial markets at the European level. Its objective is to prevent and mitigate systemic financial stability risk in the European Union in the light of macro-economic developments. The ESRB carries out a range of tasks including the collection and analysis of relevant information, risk identification and prioritisation, issuing warnings and recommendations and monitoring their follow-up, and providing assessments to the Council on the existence of any emergency situations that may arise. It also cooperates with other members of the ESFS and coordinates actions with other international financial organisations such as the International Monetary Fund (IMF) and the Financial Stability Board (FSB). ESMA contributes to the work of the ESRB, by providing data and undertaking stress tests in close co-ordination with the other ESAs and the ESRB. ESMA is a voting member of the General Board, along with the other ESAs, the European Commission, the President and Vice-President of the European Central Bank, the Governors of the national central banks, the Chair and Vice-Chairs of the ESRB's Advisory Scientific Committee and the Chair of its Advisory Technical Committee.